Whether you're looking to cut down the cost of energy bills or make an old home more energy efficient, our tips and tricks are here to prove that while period homes tend to have a reputation for being draughty and expensive to run, it doesn’t have to be that way. While old, uninsulated solid-wall homes do lose more heat than newly built houses, and outdated, inefficient appliances and fittings use more energy than necessary, it is possible to carry out some simple improvements to make your home warmer and reduce bills. Looking to take on more home renovations? Visit our hub page for tips on everything from reopening hidden fireplaces to fixing old wooden flooring. Our guide to renovating a house is a good read, too, if you're taking on a larger project. When it comes to making significant changes to an old home, there is much conflicting information around what is the best course of action to take, especially if you're dealing with a listed building or property located in a conservation area – our specialist guides have details on what to do in either of these circumstances. The biggest issue is when inappropriate, non-reversible changes are made, or when breathable materials are not specified. Consider carefully what advice you follow when tackling areas such as heating and insulation, and only work with companies that have experience of dealing with period properties. Where possible, repair rather than replace and check with your local authority before introducing any energy-saving measures that may have a physical or visual impact on your property. Monitoring your energy use will help you to establish how well your house performs and where savings need to be made. British Gas can install a smart meter for free for customers. Old floorboards add character to a room, yet it’s astounding how much heat can be lost through the gaps between them: added up together it can be the equivalent of a small window being permanently left open. While simply laying down a large rug in winter can provide extra insulation, fixing the problem may provide a better solution long term. In fact, The Energy Saving Trust estimates that filling gaps can save up to £40 per room, per year. See our guide to how to fix draughty floorboards for step-by-step instructions. Another easy way to make an old home more energy efficient is by updating light fittings and swapping old-fashioned tungsten bulbs for LEDs, which on average last 25,000 hours, can instantly reduce electricity consumption. While LED lamps can be expensive to buy, savings in electricity bills will usually offset the cost. The lamps now come in all styles, from dimmable spotlights to filament. An annual service is important to ensure your boiler is working as well as it should, but if it’s more than 10 years old you should consider replacing it with a highly efficient condensing model, which can save you up to £305 per year. If your radiators aren’t working effectively, check to see if they are colder at the top than at the bottom, as this means there could be trapped air in the system. Bleeding them to solve the problem is a straightforward task that can be done on a DIY basis. If, however, the top of the radiator is hot and the bottom cold, or generally they aren’t that warm, then there is probably sludge in the system that needs flushing out – a process that usually costs around £500. Narrow gaps around windows and doors can create uncomfortable draughts as well as rattling noises. Avoid using silicone sealants to fill gaps and instead use draught strips, which can be removed in the future if required. Also look at non-obtrusive solutions for letterboxes and keyholes, and draught excluders. Sash windows can also be an issue due to the necessary gap around the sliding mechanism, but specialist companies such as Ventrolla and The Sash Window Workshop can add discreet draught-proofing. Find out how to restore and maintain your timber windows; use our guide to maintaining and repairing metal framed windows, too. Alternatively, consider replacing period doors and windows with authentic designs – our guide to how to choose windows for period homes provides plenty of inspiration. Around a quarter of a home’s heat is lost through an uninsulated roof space, but this is fairly easy to improve with adequate insulation. The most widely used material is mineral wool (around 27cm to 30cm deep) as, at around £20 per roll, it is very cost-effective. Although unpleasant to fit, requiring the use of protective clothing, mineral wool has good fire resistance and sound-insulation qualities. Natural materials, such as sheep’s wool quilt or loose cellulose (made from recycled newspaper) are nicer to work with and well suited for use in older houses, but also consider a breathable spray foam insulation such as Icynene. Our essential guide to roof insulation explains everything you'll need to know when insulating a loft in order to make an old home more energy efficient. The most popular renewable energy sources for period properties are solar and wind, but drawing energy from the ground and air are also possibilities. While renewables can give considerable savings on your bills, they can also have a negative impact on your home’s appearance, so make sure you have all the facts before investing. Find out more about renewables on our eco hub page. 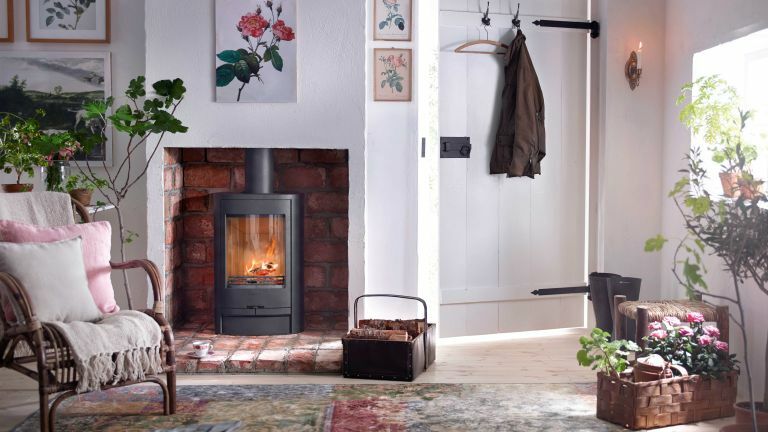 Browse our essential guide to choosing a stove if you need more help choosing the best model for your home. Contura’s 810L wood-burner is small enough to fit into an existing fireplace opening, yet can heat large spaces of up to 90m2. Not only can original window frames be the cause of draughts, but the glazing is often very thin, creating a cold internal surface. As a result, these architectural antiques tend to be replaced for modern double-glazed designs. It's worth remembering, however, that as long as the windows are repairable, it is possible to look at fitting secondary glazing. Want more information on how to install secondary glazing? You'll find everything you need to know over in our specialist feature. Thermostatic radiator valves and smart thermostats offer control over individual heating zones, to prevent heat from being wasted. Use our guide to smart thermostats to find out how you could benefit from having one, and find the best smart thermostats in our buyer's guide. It has been calculated that over four per cent of a home’s heat is lost straight up an open chimney, but this can be easily solved by inserting a device that blocks the draught, such as the Chimney Sheep. Made of a thick layer of felt, it can be inserted up the chimney when the fireplace isn’t in use and simply removed when you want to light a fire. If the fireplace is never used, you could opt for a chimney balloon instead. A subscription to the UK's best-selling period homes magazine makes the perfect treat for yourself or a friend. It is estimated that 35 per cent of an uninsulated building’s heat can be lost through the walls, but this is disruptive to address. Homes built before 1920 had solid walls, as opposed to including a cavity that can be filled with insulation. Solid walls can be insulated either internally or externally – but both solutions involve covering the existing wall finish, which can mean the loss of period features. For internal walls, rigid insulation boards can be applied, or a stud wall constructed and filled with soft insulation. Plaster is then applied over the top. This inevitably affects existing skirting and cornicing. The cost of internal wall insulation is around £40 to £50 per m2. To insulate external walls, a layer of insulation is applied and covered with lime render or other cladding. This can totally change the look of a house and affect elements such as overhangs, windowsills and door openings, so is not suitable for the beautiful façades of many period homes. The cost for adding external wall insulation to an average three bedroom semi would be from £5,000 to £9,000. Find out more about insulating your home in our guide. Around 10 per cent of a property’s heat is lost through floors, so insulating them should make a big difference if you're looking for ways to make an old home more energy efficient. There are two types of floor: solid or suspended timber. Solid floors are in direct contact with the ground, so without lifting them it is difficult to add insulation, but topping them with breathable, natural carpets, such as coir, will help. Avoid rubber-backed designs. If the original floor has previously been replaced with concrete and includes a damp-proof membrane, then laying a floating wood floor on top can improve thermal performance. If there are damp problems with a concrete floor, consider replacing it with limecrete, made of breathable lime and aggregate. Suspended floors are straightforward to insulate where there is access from below, such as a cellar. Quilt-type insulation can be fitted between the joists, supported with netting. Insulating from above involves lifting floorboards, so think twice if the floor is of historical value. If you do disturb the boards, lift a small number at a time. A variety of soft insulating materials can be used, supported by nets, or rigid materials can rest on timber battens. For guidance as to how to insulate floors in old homes, take a look at our specialist guide. Fit enhancers behind your radiators to reflect heat back into the room. In addition to preventing heat loss through the walls, this can save as much as seven per cent on heating bills. It should cost less than £10 per radiator to install. Thermally lining your curtains can reduce heat loss by up to 14 per cent. Single glazing has a U-value of 5.5W/m2, but this can be brought down to 1.0W/m2 with thermally lined curtains. It will cost from around £20 per curtain. If your first floor (or second floor in a three-storey house) rooms have a sloping part, this is often because plasterboard has been fitted to allow cold air to circulate above and ventilate the rafters. This can lead to phenomenal heat loss if not insulated properly, so fit insulation boards and re-plaster. This can be expensive but makes a big difference to the warmth and thus comfort of a room. The cost would be from £12/m2 including labour.